Proceeds from charity sale support home health and hospice services. 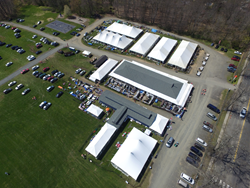 The VNA Rummage Sale, with two acres and 26 departments of merchandise, will take place May 6, 7 and 8, 2016 at the Far Hills Fairgrounds in Far Hills, NJ. Two acres of merchandise and 26 departments are waiting for bargain shoppers and garage sale fans at the VNA Rummage Sale, which will be held on Friday, Saturday and Sunday, May 6, 7 and 8, at the Far Hills Fairgrounds, located at the intersection of US Route 202 and Peapack Road in Far Hills, New Jersey. The sale is open 9:30 a.m. until 3:30 p.m. on Friday and Saturday, and 12:30 p.m. to 3:30 p.m. on Sunday, rain or shine. The VNA Rummage Sale has shopping opportunities for all ages and interests. The variety of high quality merchandise includes adult and children’s clothing and accessories, furniture, home goods, pet supplies, artwork, toys, sporting goods, fine and costume jewelry, antiques, kitchenware, appliances, electronics, lighting fixtures, books, cameras, vintage items, musical instruments, vinyl records, fabric and sewing accessories, holiday decorations and more. Goods are sorted, checked for cleanliness and damage, and organized on racks and shelves by more than 400 volunteers. Proceeds help the VNA give all families equal access to the agency’s full range of home health and hospice care services, regardless of their ability to pay. Funds raised also ensure that all members of our community can benefit from important and innovative programs uncompensated by Medicare, Medicaid or private insurance. Credit cards (Mastercard and Visa), cash and checks are accepted in all departments. Photo identification may be required for credit cards and checks. Short walking distance from the NJ Transit Far Hills Station. The Visiting Nurse Association of Somerset Hills and its subsidiaries provide individuals and families with comprehensive, high quality, cost-effective home and community healthcare services, regardless of ability to pay, using partnerships where appropriate. The VNA is a charitable, tax-exempt home health agency and hospice certified by Medicare, accredited by the Community Health Accreditation Program (CHAP) and licensed by the New Jersey Department of Health and Senior Services. For more information, visit http://www.visitingnurse.org.